Today I'm using some of my older ODBD stamps - but the Word is eternal and this verse is just very encouraging. The Shining the Light Challenge at ODBD is to make a card using at least 4 letters from the word BLESSINGS. As the Bible is a huge blessing to all believers, I knew one of my word would have to be Scripture. To see all the creations in one place or join the challenge, click here. You have until November 30, 2014 at 8:00pm EDT to join us. By participating in the challenge, you have a chance to be placed in a monthly drawing to win a $15 ODBD Gift Certificate good towards the purchase of stamps in the “stamps column” on the ODBD website, or to be spotlighted on the ODBD Blog at our next challenge. The random prize winner will be posted on the first challenge of each month.We would love to see your creations. 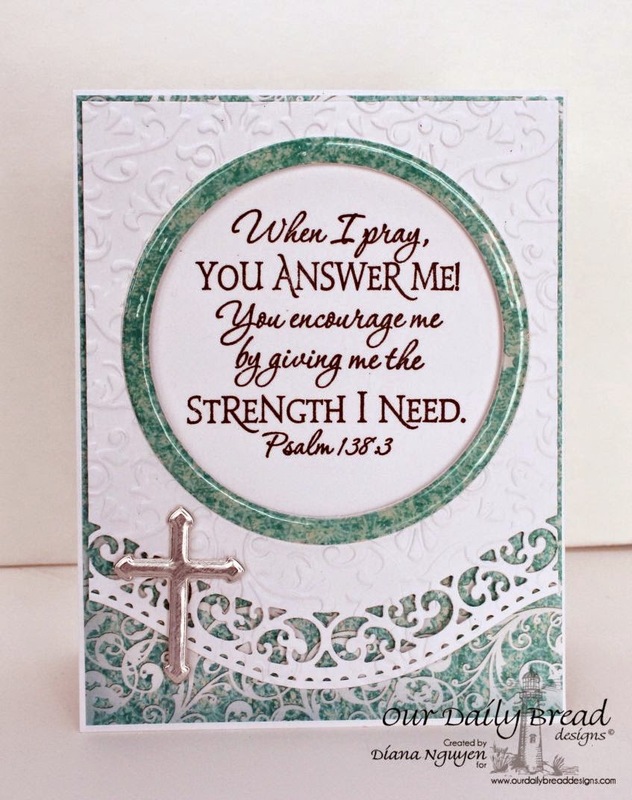 Oh, Diana, you truly have made this Scripture verse the focal point of this beautiful card! And, yes, it is a blessing to have God's Word. I just love the layout and how beautiful it is with the border and the embossed cross. Yes, I forget about glossy accents, and it really makes the "frame" look like marble...stunning! I totally love this verse knowing that God is always with us no matter what we are going through...praise God! Another beauty, my sweet friend! Hugs! What a powerful verse Diana!! Such a comfort to have Him to carry us and give us strength!! Your colors and design are exquisite!! So elegant and it makes the scripture the focal point! Gorgeous creation my friend!! Lovely Diana!! 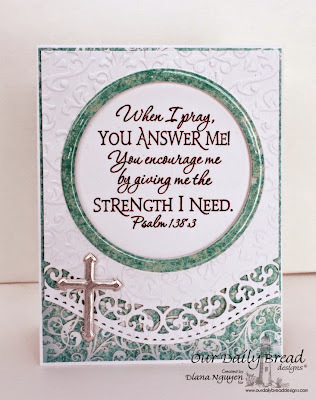 Love the verse you used and I just adore your border die cuts, embossing and circle frame...so beautifully done! Wonderful card!! I love the beautiful verse and that silver cross makes it extra special!! Beautiful Diana! Love the powerful verse you chose and the use of glossy accents for the framing!